Sometimes, the unexplained weight gain, feelings of sadness, and fatigue can only be symptoms of malfunction of the thyroid gland. The role of this gland is very important for our overall health, and unfortunately, millions of people suffer from some kind of thyroid disorder. It plays a critical role in your metabolism, and along with insulin and cortisol, the thyroid hormone is one of the big three hormones that control your metabolism and weight. However, its function can be improved and healed with the help of a healthy diet. They are excellent in the case of hypothyroidism, as they are abundant in zinc, just like legumes, nuts, crabs, oysters, and sunflower seeds. This herb is popular in Ayurvedic medicine, and it prevents hypothyroidism by converting certain hormones into a more potent form. Fruits high in pectin, a gelatinous fiber that reduces the levels of metals linked to hypothyroidism, like apples, pears, plums, and citrus fruits, are beneficial in the case of thyroid issues. These nuts are rich in selenium, whose deficiency has been linked to hypothyroidism. Other rich selenium sources include tuna, sardines, legumes, beef, turkey, chicken, and eggs. Vitamin A lowers TSH blood levels, and thus prevents hypothyroidism. You can take Vitamin A supplements, but note that the recommended dosage is 5,000 IU daily. Vitamin D deficiency has been linked to hypothyroidism, so make sure you increase the intake of foods like Fatty fish, eggs yolks, cheese, beef liver, and foods fortified with vitamin D, like some dairy products, orange juice, soy milk, and cereals. Chickpeas are rich in fiber, which treats constipation, and zinc, which improves the function of the thyroid. Studies have shown that only 26 milligrams of zinc daily can fight hypothyroidism, so you should consume foods rich in it, like meat, shellfish, eggs, dairy, whole grains, seeds, and nuts. Iodine is vital for a healthy thyroid function, and seaweed is one of its best sources, along with eggs, dairy, and fish. Yogurt is rich in vitamin D, and Hashimoto’s disease, an autoimmune disorder linked to its deficiency, is a common cause of hypothyroidism. Sardines are full of omega-3- fatty acids, which support the thyroid function, boost immunity and fight inflammation. 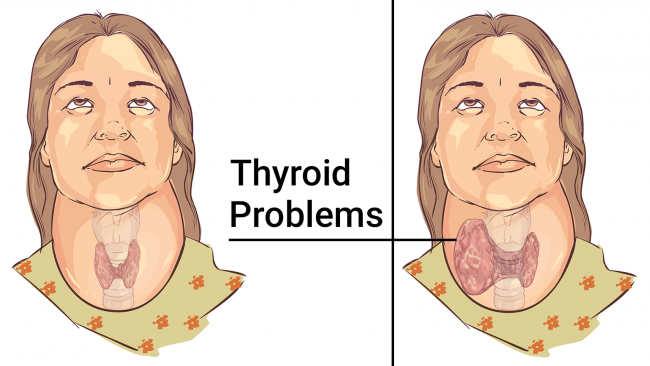 Yet, note that you cannot cure your thyroid issues by eating these foods alone. You need to combine such a diet with a regular exercise, and the right medication. Additionally, endocrinologist Elizabeth Pearce, MD, associate professor of medicine at Boston University School of Medicine claims that you will also keep the thyroid in shape if you address your stress levels. It is believed that autoimmune disorders, such as a thyroid disorder, occur following severe stressors. Even though the evidence is mostly circumstantial and tied more closely to Grave’s Disease than to hypothyroidism, it remains a fact that in order to stay healthy, you need to lower stress. You can try various stress-reducing methods, or do the following two-minute fix: close your door, turn off the lights and get into child’s pose. Then, stretch the arms out in front of your body, and start breathing deeply.